Epidemiological surveys have provided key information about the prevalence and degree of seriousness at different ages of a wide array of problem behaviors such as delinquency, substance use, early sexual involvement, and mental health disorders. Knowledge of the extent of these problems and changes in their course over time is important. In its absence, interventions and health planning in general can be difficult. Understanding which risk and protective factors are relevant to which problem behaviors is also essential for the formulation of theories that constitute the basis of intervention. *What is the prevalence and age of onset of delinquency, substance use, and early sexual behavior for three samples of boys age 8, 11, and 14? What are the average mental health problems for these ages? How strong are the relationships among these problem behaviors in each of the samples? 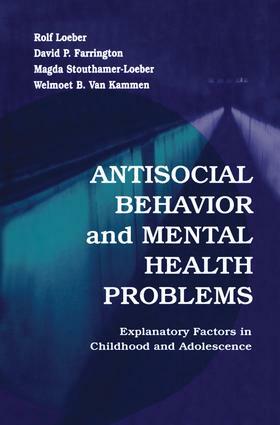 *Which variables best explain individual differences among the boys in their manifestations of delinquency, substance use, early sexual behavior, and mental health problems? To what extent do explanatory factors vary with age? How accurately can boys with different outcomes be identified by risk scores based on hierarchical multiple regressions? *To what extent are explanatory factors associated with one outcome that are also associated with other outcomes? Are explanatory factors that are especially characteristic of a multiproblem group of boys--who display many different problem behaviors--different from explanatory factors associated with boys with few problems? *Do the results fit a general theory of juvenile problem behaviors, or is a differentiated theory more applicable?